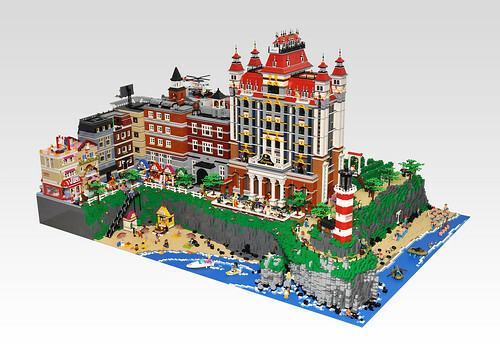 Brick Town Talk: Seaside Stay - LEGO Town, Architecture, Building Tips, Inspiration Ideas, and more! Ocean Drive - (BTT) While we have done our fair share of covering the very best in hospitality over the year, I dare say this might be the most opulent let, if only for the site alone. Perched just feet away from the ocean, the Hotel Creators dwarfs the buildings around it, including the adjacent lighthouse. Thankfully it does its guests a great service is being beautiful in addition to big - a grand entry sets the stage at the ground floor, while the rest of the building's massing is playfully broken up with a series of setbacks, towers, and balconies.